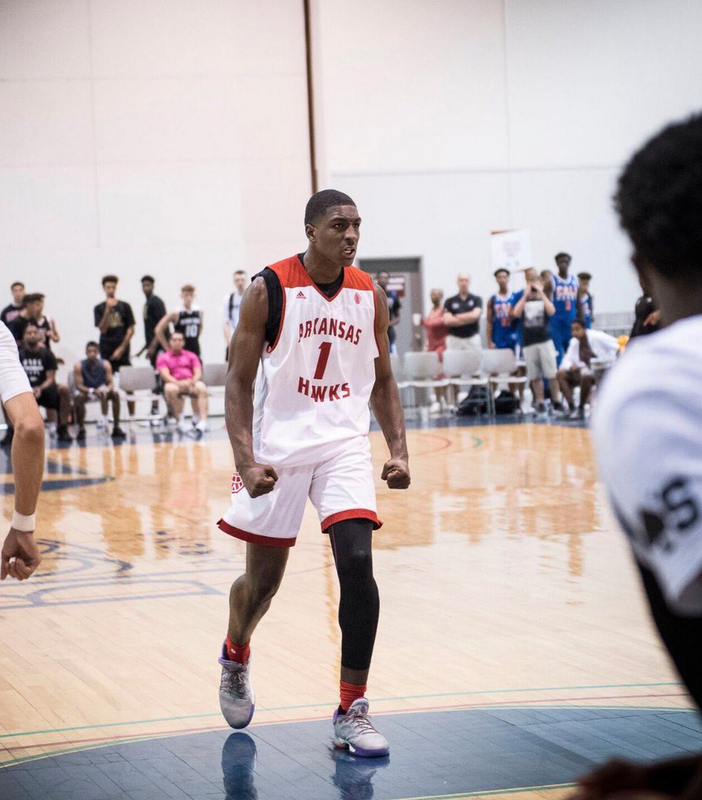 2018 5-star power forward Reggie Perry is a Mississippi State commit and the 6-9 do-it-all talent is a rising star. The Thomasville high school star is a point forward that is getting better with each game that he plays. He has great court vision, can work you in the post, can step outside and make you pay plus he is dynamic in transition. Perry is the 2nd rated prospect in the state of Georgia, 7th rated power forward and 29th rated player in the country for the class of 2018 by 247 sports. He is the 34th ranked prospect in the class of 2020 by NBA Draft Room but could be moving up the board. I see a Perry as a mix between Draymond Green/Steve Smith/Scottie Pippen He is physical but can also play with finesse and has the all-around ability to make players around him better. He was under a lot of unfair judgement because he de-committed from Arkansas, in this interview we clear the air. He talks why he left Arkansas, What family means, and when he is deciding to go to the NBA. LJ: It was a great NCAA season with Villanova winning it all. What do you think of the tournament play and so many upsets? What does that say about NCAA basketball? Reggie: I really enjoyed the NCAA basketball season. It really shows that there are a lot of great teams out there besides those that have been known as power houses. I love to see underdogs or those that have been overlooked come in and prove themselves. NCAA basketball shows that there is lot parity and you can’t count anyone out. LJ: The NBA is having its transition of young stars like Ben Simmons, Joel Embiid, Greek Freak and more. What young star impresses you the most and why? Reggie: Jayson Tatum impressed me a lot. He was able to step up his game up when the going got tough. He really showed up when his team needed him the most. LJ: Do you feel you will be ready for the NBA after two years of college ball? Why? Reggie: Actually, I think I may be ready for the NBA after my first year of college. The NBA game has changed to suit my style of play as it is becoming position-less. More importantly, I believe this because I will now have access to player development at Mississippi State. This is something that was not in place my small rural high school as many prep-school players may have. I have not even scratched the surface as to how great I can be. LJ: You are ranked #34 on NBA Draft Room 2020 NBA draft class. I feel you are a lottery talent no question you have shown too much athleticism and basketball IQ at your size. What do you feel you offer to an NBA team? Reggie: I appreciate that you think I am a lottery talent. I can only get better. Being coached by Coach Howland and his staff, my athleticism, my basketball IQ, my versatility, my rebounding, and defending will drastically improve after one year. I have never had access to the type of training or development that I will have while at MSU. LJ: Your mom and your dad do a great job with you. Your mom is one tough cookie she doesn’t play about you. What have your parents taught you that have helped you to get here? Reggie: LOL…you got that right. My parents have taught me so many things. My father has taught me the game, while my mom taught me how to define, assess and reassess my goals and skills, as well as pay attention to detail while having self-control and good sportsmanship. Between the two of them, staying humble while remaining hungry is always something they have instilled in me. Humble enough to understand that I can learn from anyone and hungry enough to always work hard and always look to improve as a player/individual. But the main thing my parents always remind me to give God all the glory in my life. He is the One that gave me my gifts and talents and it is my responsibility to make good of what He has given to me while being my best in Him. LJ: It’s your floor. So much craziness has been said about your decision to switch from Arkansas to Mississippi State. Why did you choose to switch? Reggie: I must say it was a tough decision to change because of the pressures that was coming my way. But in the end, after sitting down talking with my parents and brother and sister, I had to do what I believed was best for me. As long as those who loved me the most had my back, I couldn’t worry about what others thought. When I made my decision to commit to Arkansas I was 16 years old and never had the opportunity to assess other schools. My 11th grade year, my father had been battling some health issues that I don’t wish to go into because that is my family business. Experiencing things that a normal 16 or 17 years old would not normally experience made me see life differently and made me mature in other areas faster. That coupled with being very impressed with Coach Ben Howland’s track record. He has had several players at UCLA who ended up in the NBA that are still in the NBA (Kevin Love/Russell Westbrook/etc.). His track record, connecting with the coaches and players as well as wanting to honor my father influenced me to stand up and make the decision that I believed was best for me. This was something that I had to do. LJ: You had 15 points and 7 rebounds in the McDonalds all-American game. I feel you let the world know who you were on a big stage. 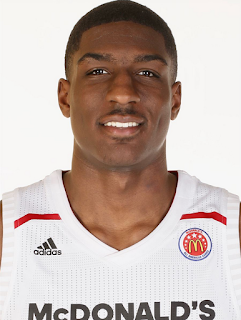 How did it feel to be chosen and play in the McDonalds all-American game? Reggie: It felt great. Many years ago, I wrote down some goals that I looked at daily. Being able to achieve that goal and to share it with my family was the best feeling and I will never forget it. LJ: If you had to choose what NBA team would you play for? Reggie: Really, it would be a dream come true and an honor to play for any NBA team. However, if I had to choose one, I would say the San Antonio Spurs. I like the way they share the ball with one another. LJ: What NBA player resembles your game the most? What NBA player do you want to play against the most? Reggie: I get that question a lot. I would say, I am a mixture of several players in the NBA which once I perfect those areas, will make me undeniably dangerous. This is unique as I resemble, Jayson Tatum, Draymond Green, a little LeBron James and Kevin Durant. With the potential of continuing to grow as well as getting bigger, faster and stronger while working at Mississippi State, this will allow me to increase the effects of my versatility, scoring and defending, which makes me very dangerous. I respect LeBron James and what he has brought to the game of basketball. I look forward to the day of playing with or against him one day. LJ: What about your game has improved the most? Reggie: My Passing and defensive skills have improved the most. I have been working on my ability to see the floor and getting the pass to my teammates. I have also made it a point to work on my defensive skills by becoming more explosive with rebounding and blocking shots while working on my foot speed to get up and down the floor. The NBA is becoming a position-less game so I must be able to defend everyone. LJ: Do you still talk to some of your former Arkansas teammates? Reggie: Absolutely. I talk with them all the time. I have been with those guys since the 6th grade and we grew up together as brothers. Even though we share playing the same game and on the same team in common, we have so much more than that. We have built lifelong friendships with each other. Long after the basketball stops bouncing, we will still be friends/brothers. LJ: What about your character will NBA teams like? Reggie: I believe the NBA will like that I continue to get better. Every time I step out on the gym floor, they will see improvement. In addition, they will like that I won’t let anyone out work me. They will never have to worry about me not doing what I need to do to get better. My passion, my “Can Do” Attitude, poise and accountability, respect for the game and loyalty to the franchise will allow me to stand out in character. LJ: Do you feel you could impact an NBA team right away? Do you feel you are a franchise player? Reggie: Absolutely. Understanding my role and playing my role will allow me to impact any NBA team right now. My ability to be coachable will allow me to get better and more mature. This could lead to being a franchise player. LJ: What AAU team do you play for now? What was your best game stats wise in AAU so far? Reggie: My last team that I played with was the Arkansas Hawks and that was last summer. I never really kept up with my stats. I only focused on how I could better and how I could make my team better. LJ: Congratulations on winning the championship at Thomasville. What were your averages this past season? Reggie: I really don’t know what my averages were…. LOL. I was not able to play the kind of basketball that I played with my travel team. My role at my high school was do whatever the team needed at that time and allow my coach to coach me the way he needed to, in order to win a state championship. While this may have hurt me statistically or even my rankings, I know that when it is time for the team to rise to the top, everyone will see the real Reggie Perry. LJ: A lot of prospects test the waters even if they go back to school. Will you test the NBA draft combine just to test the waters? Reggie: I can’t make any promises however I know that I am planning to major in sports management at Mississippi State University and my goal is to be a “One and Done”. We will see what God has in store for me.